Inventory We are a resale marketplace, not a box office or venue. Ticket prices may exceed face value. This site is not owned by Saenger Theater . The Saenger Theatre opened way back on February 4, 1927 too much fanfare and since that time has been added to the National Register of Historic Places. First built for silent movies and an orchestra the Saenger Theater now plays host to many different traveling Broadway shows and performers. The venue was devastated in 2005 due to Hurricane Katrina and had a major $33.8 million dollar renovation in 2009. 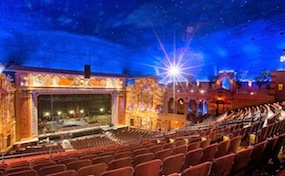 Saenger Theater New Orleans tickets are scheduled to include events like the Book of Mormon, Sister Act, War Horse, Beauty and the Beast and many more. The Saenger Theater box office is located at 1111 Canal Street in downtown New Orleans, Louisiana. Saenger.TheaterNewOrleans.com is a privately owned and operated company that specializes in all online retail of tickets in the resale secondary market. We are not currently affiliated with any official website, box office, and or primary supplier. Prices on our site can fluctuate above or below face value and have a tendency to change quickly with market conditions. To order tickets to all Saegner Theater New Orleans events simply follow all of the steps online through the checkout page or pick up a phone and dial one of our friendly operators at anytime.